The Classic Signature Foods product line is taste-test proven to consistently be one of the best in quality, texture, and flavor on the market today. Our fresh, in-house manufactured ingredients and a culinary perfectionist streak are our secrets… along with some delicious family recipes. 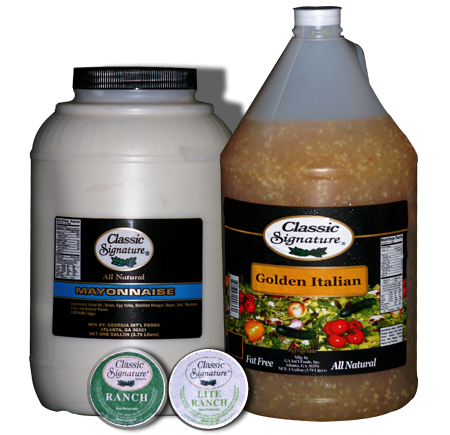 When you partner with Classic Signature Foods, we guarantee an outstanding relationship focused on excellent quality and service with competitive pricing. Our superior product is based on fresh with no preservatives ingredients, state of the art temperature-controlled production area that will produce high quality and delicious product that will ensure happy customers. We currently do not sell or ship to the general public. When ordering for the first time, please supply us with your company name, billing/shipping address, and Sales and Use Tax Exemption Certificate/Resale number. Please place orders three weeks in advance. Please allow two weeks or ten business days. Any questions may be sent to info@classicsignature.com.